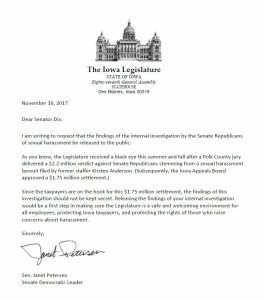 In the wake of a $1.75 million settlement, Senate Democratic Leader Janet Petersen today called on the top two Senate Republicans leaders -- Senate President Jack Whitver and Senate Majority Leader Bill Dix -- to release to the public the findings of their internal investigation of sexual harassment. Senators Ragan and Mathis respond to the retirement of DHS Director Palmer. As the first-in-the-nation caucus state, Iowa should have the best-in-the-nation election laws. Democrats believe that means Iowa’s elections must be the most accurate, secure and efficient in the country, without disenfranchising a single Iowan. Those values will guide our decisions to support or oppose proposed Republican changes to Iowa's election laws.